“Global surface temperature change for the end of the 21st century is projected to be likely to exceed 1.5°C relative to 1850 to 1900 in all but the lowest scenario considered, and likely to exceed 2°C for the two high scenarios,” said Co-Chair Thomas Stocker. “Heat waves are very likely to occur more frequently and last longer. As the Earth warms, we expect to see currently wet regions receiving more rainfall, and dry regions receiving less, although there will be exceptions,” he added. Projections of climate change are based on a new set of four scenarios of future greenhouse gas concentrations and aerosols, spanning a wide range of possible futures. The Working Group I report assessed global and regional-scale climate change for the early, mid-, and later 21st century. 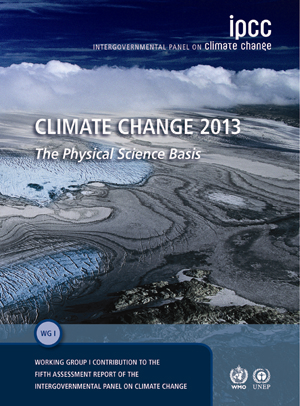 The IPCC supplies policy-relevant information about climate change to the world’s governments. Its Fifth Assessment Report (AR5) will be considered by negotiators responsible for concluding a new agreement under the United Nations Framework Convention on Climate Change (UNFCCC) in 2015. The global mean average surface temperature rose by 0.89°C from 1901 to 2012. Each of the last three decades has been warmer than all preceding decades since 1850. In the Northern Hemisphere, 1983-2012 was likely the warmest 30-year period of the last 1400 years. The first decade of the 21st century has been the warmest of all (WMO’s The Global Climate 2001-2010 estimates the global average surface temperature for that decade at 14.47°C). Global average temperatures will likely rise by another 0.3°C to 0.7°C in the period 2016-2035. Averaged over the period 2081-2100, the global surface temperature is likely to exceed pre-industrial levels by 1.5°C or even (depending on future greenhouse gas emissions) 2°C. Changes in many extreme weather and climate events have been observed since about 1950. It is very likely that the number of cold days and nights has decreased and the number of warm days and nights has increased on the global scale. In in large parts of Europe, Asia and Australia, it is likely that the frequency of heat waves has increased. It is virtually certain that the upper ocean (down to 700m) has warmed from 1971 to 2010. The deep ocean below 3000m has also likely warmed since the 1990s, when sufficient observations became available. Ocean warming accounts for most of the change in the amount of incoming solar energy stored by the Earth, accounting for about 93% of it between 1971 and 2010. The global ocean will continue to warm during the 21st century. Heat will penetrate from t   he surface to the deep ocean and affect ocean circulation. The rate of sea level rise since the mid-19th century has been larger than the mean rate during the previous two millennia. The global mean sea level rose by around 19 cm from 1901 to 2010 due to increased ocean warming and melting glaciers and ice sheets. The rate of rise accelerated between 1993 and 2010, and it is very likely to increase further during the 21st century and beyond. The report notes that, during the last interglacial, when the climate was 2°C warmer than pre-industrial levels, maximum global sea levels were 5 to 10 meters higher than they are today. Seawater has become more acidic (its pH has decreased by 0.1) since the beginning of the industrial era due to humanity’s carbon dioxide emissions; it will continue to acidify during the 21st century. It is very likely that the Arctic sea ice cover will continue to shrink and thin and that      Northern Hemisphere spring snow cover will decrease during the 21st century as global mean surface temperature rises Some scenarios foresee a nearly ice-free Arctic Ocean in September before mid-century. There is very high confidence that glaciers have continued to shrink and lose mass world-wide, with very few exceptions. By 2100, glacial volume could, under one scenario, decline further by as much as 35-85%. Meanwhile, the extent of Northern Hemisphere snow cover has decreased since the mid-20th century, especially in spring, and this decline, too, will continue. It is likely that human influences have affected the global water cycle and its patterns since 1960. For example, in recent decades precipitation has increased in the mid-latitude land areas of the Northern Hemisphere. Three years in the making, the “Physical Science Basis” volume of the Fifth Assessment Report was produced by over 250 scientists. Additional volumes on impacts, mitigation and a synthesis will be released over the coming year. The IPCC does not conduct new research. Instead, its mandate is to make policy-relevant assessments of the existing worldwide literature on the scientific, technical and socio-economic aspects of climate change. Its reports have played a major role in inspiring governments to adopt and implement the United Nations Framework Convention on Climate Change. The Summary for Policymakers of the Working Group I contribution to the IPCC Fifth Assessment Report (WGI AR5) is available at http://www.climatechange2013.org or http://www.ipcc.ch. See separate Fact Sheet of Headline Statements from the WGI AR5 Summary for Policymakers, available at http://www.climatechange2013.org. By caribbeanclimate in News on September 27, 2013 .